The OMEGA PX273 is an all stainless steel wet/wet differential pressure transmitter, incorporating dual diffused piezoresistive sensing elements with stainless steel media isolation. The unit is compatible with all media encountered in industrial applications, including freon, ammonia, treated water, and steam. 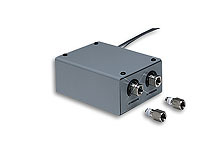 The PX273 is ideal for monitoring and controlling pump differential pressure, CW/HW system differential pressure, chiller/boiler differential pressure drop, and many other industrial applications.